Drs Arwen Nicholson and Duncan H. Forgan from the University of Edinburgh had previously calculated that if a Voyager-sized probe passing through the galaxy picked up speed using slingshots around stars it could travel 100 times faster than otherwise. The slingshot technique uses the gravitational field of stars or planets to "slingshot" a craft and boost its speed. 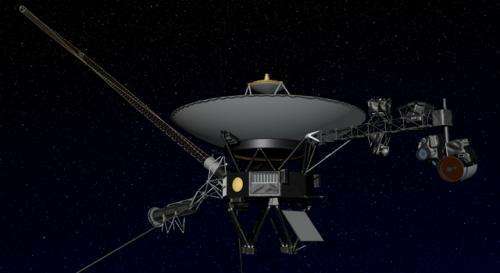 The Voyager 1and 2 probes launched by NASA in 1977 used slingshot maneuvers around the planets they passed to pick up speed, and Nicholson and Forgan calculated that interstellar probes could use the same technique around stars. The new calculations, reported in the International Journal of Astrobiology this week, expanded on the previous work by using "self-replicating" probes in the computer models to see how the self-replication would affect the timescale. The robotic probes could explore our galaxy and self-replicate themselves from interstellar dust and gas, after which the parent and child probes would each set off for a different star, where they would look for signs of life and then self-replicate themselves again. The probes would therefore disperse themselves radially across space. In all the scenarios the scientists looked at, exploration timescales were reduced when the probes were self-replicating, and they concluded that a fleet of self-replicating probes could travel at only 10% of the speed of light and still explore the entire Galaxy in the relatively short time of 10 million years. This is a tiny fraction of the age of the Earth and the scientists say the results reinforce the idea of the "Fermi Paradox." The Fermi Paradox, proposed in 1953 by physicist Enrico Fermi, suggests there is a contradiction between the high probability that civilizations exist elsewhere in the Universe and the fact that there has been no contact between ourselves and other civilizations.